Pune: Brazilian striker Marcelinho produced a superb hat-trick as FC Pune City scripted a 5-0 drubbing of NorthEast United in an Indian Super League (ISL) match at Shree Shiv Chhatrapati Sports Complex Stadium, in Pune on Saturday. 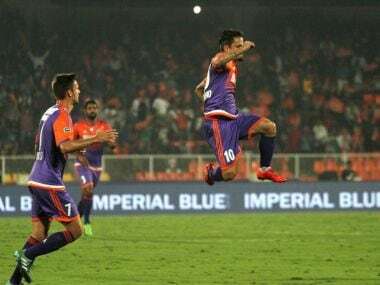 Brazilian striker Marcelinho scored a fabulous hat-trick after Ashique Kuruniyan had opened the account in the eighth minute and Adil Khan hammered the final nail late in the game as Pune City took a giant leap in standings. Pune have now moved to the second spot with 15 points from eight matches and are just a point behind league leaders Chennaiyin FC. NorthEast United suffered their fourth successive defeat in the Hero ISL and are just above Delhi Dynamos at the bottom of the league table. The Highlanders have four points from seven matches and have not picked up a point since defeating Delhi Dynamos for their only win on 2 December. The match was all over as a contest inside the first 45 minutes when Pune City grabbed the chances that came their way. The home side had three shots on target and all three of them ended up being goals. NorthEast United also had three shots on goal but none of them translated into a goal, showing why the visitors had a massive shortfall in the first half. It were the visitors who had the first look at goal and should have been ahead but Marcinho shot straight into the goalkeeper after skipping past the midfield and defence. From the resultant counter-attack, Pune left NorthEast gasping with their pace as Jonatan Lucca made it all the way to the rival goal and cut it back for Emiliano Alfaro whose shot took a deflection and fell kindly for Ashique who slotted it past the goalkeeper. Pune made it 2-0 in the 27th minute when last seasons highest goalscorer, Marcelinho, showed his class. The Brazilian won a free kick just outside the box after he was fouled by Rowllin Borges and then stepped up to majestically curl the ball past the wall and into the top corner of the net. Marcelinho scored his second at the stroke of half time and this time it was the goalkeeper TP Rehenesh who was to be blamed. Marcelinho picked up a ball from Lucca and faced goal from an acute angle. He still tried his luck with a powerful attempt which Rehenesh ended up diverting into the goal through his legs. Marcelinho completed his hat-trick in the 86th minute when Marcos Tebar found his captain inside the box, and the Brazilian finished it off by beating Rehenesh at the near post. With two minutes left to be played, Adil scored his third goal of the league for Pune as he turned a ball home from a goalmouth melee.